Like millions of other patients before and after me, I heard those dismissive words and my heart sank. I had just started my second year of medical school. I had always been strong and healthy. I knew how to work hard, and I liked nothing better than to rise to a challenge, whether it was my two-year stint in the Peace Corps or that first year of medical school. Even through those long, grueling months of my mother’s battle with cancer and her early death, I had found a way to rise to the occasion. And after she died, I had begun work in a research lab where I studied and patented a natural compound that might prevent others from dying as she did. But now, seemingly out of nowhere, my body was totally out of control. Every day I struggled with anxiety that at times would erupt into full-blown panic attacks, complete with racing pulse, rapid breathing, and a growing feeling of doom. At night, I lay awake, hearing my heart beat double-time in sync with the ticking clock, unable to calm myself into sleep. I was also losing weight at an alarming rate. If I didn’t eat two pieces of Ezekiel toast spread thickly with butter right before bedtime, I would weigh in at two pounds lighter the next morning. And if that sounds like the ideal weight-loss plan, let me tell you, it was anything but. I was gaunt, haggard, and frail, my muscles trembling so badly when I went down the stairs that I had to clutch the railing for dear life. I was always hungry, even after I ate. It got so bad that while I was sitting in our school’s giant lecture hall, I couldn’t even take proper notes— my hands had developed such a pronounced tremor that my fingers couldn’t control the pen. — only to have her tell me that I had “medical-student syndrome”: believing that I had every symptom we were learning about in school. No, I insisted. I knew my body. Something terrible was going on. Stress? I had helped care for my dying mother and made it through her funeral. I had spent more than two years in the Peace Corps in a Paraguayan village so small, it wasn’t even on a map, with no running water and an eight-hour journey to the nearest telephone. I had successfully completed my first year of medical school. That was all stress— and my body had never responded with weight loss, insomnia, panic, and tremors; nothing even close. It wasn’t easy to listen to my own self-knowledge rather than the authoritative pronouncements of my doctor, especially when I was so ill I could barely function. But I’ve always been a feisty Louisiana woman— that’s how my mother raised me— and I just couldn’t go along with a diagnosis that I knew was so off base. “Please,” I insisted, “I need a complete workup.” Somehow I managed to stand my ground, and, reluctantly, she ordered a complete battery of blood tests. One week later I was spending the weekend at my aunt’s house on the Gulf Coast when I got a phone call from this very same doctor. I don’t think she actually apologized. But she did tell me that I had a serious disorder of my thyroid. 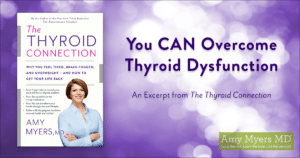 As you’ll see later in this book, there are two ways your thyroid can go out of whack. The most common is hypothyroidism, when your thyroid underperforms. Hypothyroid conditions may or may not be autoimmune. The autoimmune version is known as Hashimoto’s thyroiditis and is actually the most common form of underactive thyroid. Or you can have hyperthyroidism, when your thyroid overperforms. That less common condition is what I had, and it also may or may not be autoimmune. I had the autoimmune kind, known as Graves’ disease. When you’ve got an autoimmune disease of any type your body is basically attacking itself. The vast majority of thyroid disorders are autoimmune in nature— your immune system begins attacking your thyroid. 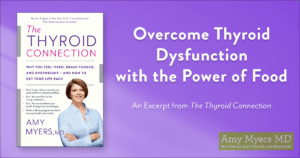 To get at the root of the problem, you need to address both the thyroid gland and the immune system, but sadly, most conventional doctors just ignore the immune system and treat only the thyroid. I would later discover that this is a very incomplete way to treat both Hashimoto’s and Graves’. 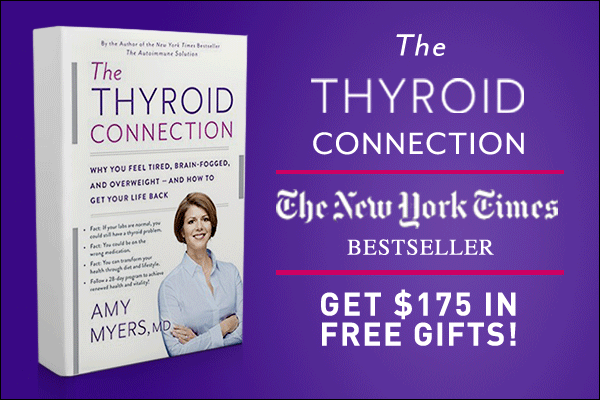 Later, I would learn that I could have treated my condition through a combination of diet, high-quality supplements, and lifestyle changes— the protocol that has become The Myers Way Thyroid Connection Plan. 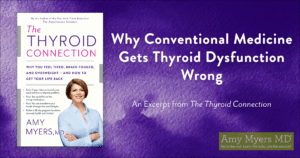 But I didn’t know then what I know now, so when I was referred to an endocrinologist— a physician who specializes in hormonal disorders, including thyroid dysfunction— I was sort of stuck with what he told me. In fact, none of those choices sat well with me. My parents had been into holistic health and Chinese medicine. I grew up eating home-cooked meals made of organic whole foods. Mom grew organic tomatoes and sprouts and fed us home-baked whole-wheat bread and homemade plain yogurt. Until I left home, I didn’t know that rice came in any color but brown. At fourteen, I became a vegetarian. Even when I entered medical school, I planned to be a holistic doctor of some kind— someone who relied on the healing properties of good food and viewed the body as a whole— although at the time, I had no idea how to pursue that goal. Of course, now I know that dairy, gluten, grains, legumes, and nightshades (tomatoes, peppers, eggplants, potatoes) can trigger inflammation—an immune system response that is at the heart of autoimmune conditions, thyroid dysfunction, and many other chronic health problems. I also know that my body needs the nutrients in wild, organic animal protein to support both immune and thyroid health as well as other bodily functions. Ironically, my vegetarianism and Mom’s “healthy foods” were part of what was making me sick. But that was something I’d learn later on. Meanwhile, I was rightly suspicious of those three conventional choices. Harsh medication with devastating side effects? Assaulting my thyroid with radioactive poison? Surgery? None of them sounded like how I wanted to treat my body. So I tried to go another way, working with a doctor of Chinese medicine who had her own herbs and dietary protocols. She loaded me up with fermented foods, sprouted grains, disgusting powders and teas and tinctures. Fermented foods can be good for your health, but not when your system is as distressed as mine was. And all the rest of it just made me feel worse. So back I went to the endocrinologist, and at this point, my symptoms were really bad. The insomnia was insane— I was lucky to get three hours of sleep a night. My heart was racing so fast that it felt as though it were beating out of my chest— and yes, I was taking beta-blockers, a prescription medication to slow my heart rate, which contributed to the brain fog. I had the sinking feeling that whatever symptom I brought in, the doctor was going to medicate it. Then I’d be dealing with my thyroid dysfunction and all the side effects. Thanks to all those sleepless nights, I was having a hard time showing up for class, and I couldn’t afford to fail medical school. So, grudgingly, I began a long, draining, and dispiriting series of conventional medical treatments. First I tried the PTU, because that seemed like the least invasive choice. Maybe it was, but it was still pretty brutal. The medicine dried out my mouth and nose to an agonizing extent, and to top it all off, the meds turned my overactive thyroid into an underactive one. Say hello to a whole new set of symptoms: fatigue, constantly feeling cold, dried-out skin, and hair that started to fall out in clumps. After a few weeks of feeling terrible, I returned to the endocrinologist. He was more worried by my chronic fatigue than my other symptoms and ran some blood tests. Later that day, he told me that the PTU was beginning to destroy my liver in a condition known as toxic hepatitis. That was a one‑in‑a‑million risk, but it had happened to me, and if I didn’t get off the medication right away, I might eventually die of full-blown liver failure. I was ordered to get into bed and stay there until my liver recovered— which could be weeks or even months. Okay, instead of three conventional choices, I was down to only two: surgery or the destruction of my thyroid via radioactive iodine. As little as the nuclear option appealed to me, surgery seemed an even more frightening prospect. I had become so debilitated and demoralized that if something had gone wrong under the knife, I seriously questioned my ability to fight my way back to life. I spent day after day searching for alternative treatments but found none. So I chose to ablate— or destroy— my thyroid with radioactive iodine. If you go this route, your thyroid gland, while it is being destroyed, can dump large amounts of thyroid hormone into your bloodstream. 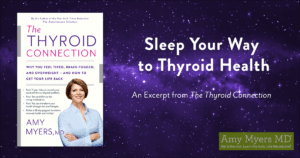 Eventually, you won’t have a thyroid at all, and you’ll have to take supplemental thyroid hormone for life. But before I could get to that point, those sudden, massive surges of hormone sent me into even more severe panic attacks made all the more upsetting because they could strike at any time. I had to add Xanax to my personal pharmacy because I literally never knew where I would freak out next— at the dog park? The supermarket? In church? I began to avoid leaving my house for any reason whatsoever; the fear of having to struggle through a public panic attack was just too great. Then, as if I were caught in a medical pinball machine, my system ricocheted back in the other direction— low thyroid. Once again I was exhausted and constantly cold. I quickly gained ten pounds, and, yep, I was back to losing hair. To make matters even worse, I developed irritable bowel syndrome. Since my thyroid had been intentionally destroyed, I now needed to take supplemental thyroid hormone, so my doctor put me on Synthroid. But my symptoms continued. 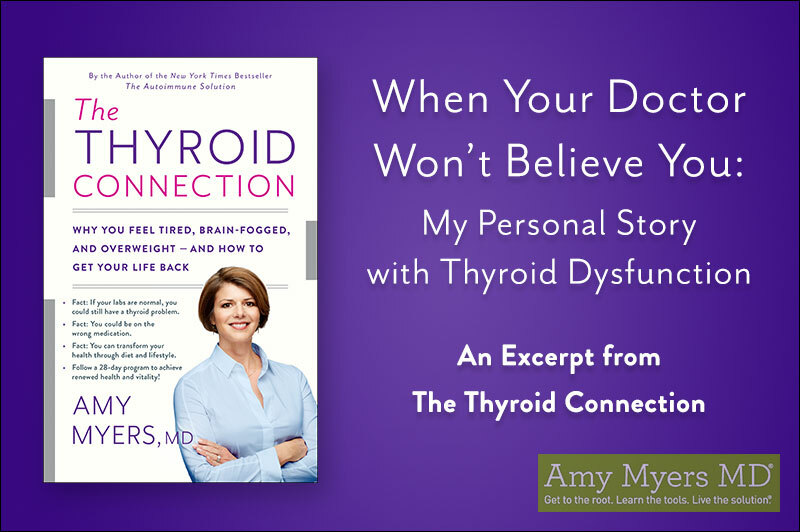 And here’s the thing: even though I felt like death warmed over, my thyroid labs were normal. So once again, I was begging a doctor to believe me. I’d run through my symptoms and say how awful I felt, and my doctor would look at my lab reports and shake his head. Talk about adding insult to injury.